Rosalie MacKenzie is headed nowhere until she sees Smokey, a Siberian husky suffering from neglect. Rosalie finds the courage to rescue the dog, and—united by the bond of love that forms between them—they save each other. Soon Rosalie and Smokey are immersed in the world of competitive dogsled racing. Days are filled with training runs, the stark beauty of rural Wisconsin, and the whoosh of runners on snow. Rosalie discovers that behind the modern sport lies a tragic history: the heartbreaking story of the Chukchi people of Siberia. When Stalin’s Red Army displaced the Chukchi in 1929, many were killed and others lost their homes and their beloved Guardians—the huskies that were the soul and livelihood of their people. Sometimes when I have a few minutes at the library, I love just browsing through the shelves and seeing the random books that look intriguing. The other day, I was doing just that on the new releases shelf when I came across An Echo Through the Snow. The first thing about it that caught my eye was the starkness of the cover, with just the picture of the dog and a woman. Then after reading the description, I decided to take a chance on it because I was sufficiently intrigued. While this is primarily a story about rescuing of dogs, dog sled racing and the history of how the Siberian husky came to be in the US, it is also a story about finding your place in the world. How for so many people we bounce around from job to job, the day in drudgery making people unmotivated to succeed and just floundering…but when that place in the world is found, the all of the pieces click into place…and that was how Rosalie’s story played out. I loved seeing her blossom as a young woman and finding her place in the world. Originally, I thought that she was a bit older than she turned out to be (18, vice in her mid-20’s) – but I think that added to her innocence during parts of the book. The use of the flashbacks to the early 20th century and a period of Russian history, I had heard of vaguely but didn’t know a lot about. It is interesting to see how different books are starting to encompass that period of history now that they are free to write about it. But at the same time, they were a bit disjointed – I didn’t realize for a while how exactly they were going to be linked – it wasn’t like they were person flashbacks in history/familial connections, but rather dream-time kind of stories, which I could see being linked into Rosalie’s Native American heritage. I think that my biggest complaint was how quickly everything seemed to progress – ultimately, the entire story took place in just under a years time – but it felt like it was moving really quickly and that everything fell into place a bit too quickly…I would have loved to have seen it drawn out a little bit more, maybe even only a couple more months to a year. But for the most part, my complaints about the book are few and far between. I enjoyed reading it and learned a lot about the sport of dog sledding (and it kind of makes me want to read some more about it and maybe travel somewhere to see a race – yes, I am that insane…). Overall, I would give this a 3.5, but rounding up to 4 stars. I think that it is a book that would probably be enjoyed by women, but I think also older teenagers, might enjoy it. 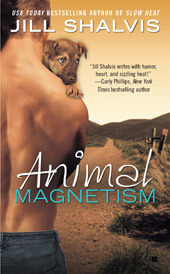 Jill Shalvis is a name that commonly comes up in romance forums for people looking for contemporary romances to read, but for the life of me, prior to listening to Animal Magnetism, I couldn’t read if I had read anything by her. I don’t think I had, or I have just forgotten (which is entirely possibly, since I am always making jokes about my mind being as leaky as a sieve). So I was looking forward to picking up Animal Magnetism and listening to it and overall, I have to say that it was an enjoyable listen. The first thing that drew my attention to the book, even before I bought the audio was the cover. I am a sucker for dogs and the eyes on the one on the cover just made my heart go awww (very similar to what my German Shepherd does to me most days – and which is he actually doing right now, since I am typing and not playing Frisbee for the 10 millionth hour today…). And the fact that there was a hot guy holding the puppy, even better -lol – what can I say. There was something about Brody, after I started reading AM that just drew me in. I think it is the guy who is a nomad, trying to find out who he is and ending up back where he began that just draws me in. Although, I will say that Lilah did kind of bug me. I understand the whole wanting to be independent, heck, I am very much like that. But at the same time, there is a difference between being independent and being stupid, and I feel that she definitely bordered on the latter, not the former. Looking back at my audio listening, I also couldn’t believe that I had never listened to anything done by Karen White prior to this – so it was a two-fer of newbies for me. I’d chatted with her several times in one of my goodreads groups, and after listening to her narration, I know that it won’t be the last time that I listen to anything done by her. I liked her range of voices for the different characters and she was even able to pull off 3 distinctive male voices, which is something that I often find female narrators have a hard time doing (and the same can often be said for males voicing females). As I was listening to her narration, I could see all the characters in my head. The production of the audio was excellent and I had no complaints about the quality of the download from audible. Overall, I’d give both the book and the narration 3.5 stars, but rounding up to 4 for the consistency between the two.